Empire Division’s Long Point Camp on Seneca Lake, hosts around 200 children each session from all across upstate New York. Yesterday marked the end of the first session at Long Point Camp for this year, which changes the lives of children. The Salvation Army’s Long Point Camp offers kids a great week of camping thanks to generous donors that make this Christian camp experience possible. We’re fast approaching Salvation Army camp season at Long Point Camp. Here’s another thank you letter from a camper to a sponsor. Jonathan Eisenhuth is a 12 year-old from Hinsdale, near Olean. These are his reflections from attending Long Point Camp last summer. 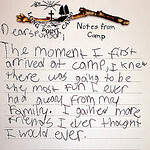 Thankful campers write letters of gratitude to Salvation Army donors who gave to camp.